The festival that introduced me to the Klezmatics, Brave Old World, Bukharin music, and so much more is back for it's 26th year. This year they are following the Boston Jewish Music Festival (or vice versa) in presenting Idan Raichel alum Ravid Kahalani, presenting "Yemen Blues." There is also an evening of music from the famed, and too-seldom-heard St. Petersburg Society for Jewish Folk Music pieces played by violin virtuoso Noah Bendix-Bagley. That scratches the surface. 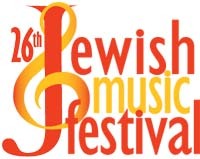 Read more at the festival website, www.jewishmusicfestival.org. Now, if the Boston Jewish Music Festival, which will be held over two weeks in 2011 from Mar 6-20 would get its own schedule up so I can start bragging on our local cats…. It's coming soon, and it, too, will be a great schedule.